Nobody guessed what we were going to do this weekend. Actually, nobody even guessed at all. My mom asked for some hints over on facebook. I guess I did leave it wide open - it could have been anything. Saturday night we went to a ballet. 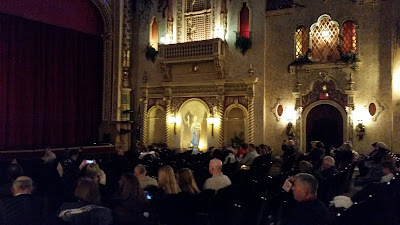 We saw the Anderson Young Ballet Theatre's performance of The Nutcracker. I'm not sure ballet is something we'll make a habit of attending, but it was interesting. I especially liked watching the little bitty kids. And the theater itself is really neat. And Sunday we went to an NFL football game. We saw the Indianapolis Colts play Houston. It was fun walking around the stadium and checking everything out. When it comes right down to it, it doesn't really matter what sport it is - basketball, baseball, football - they're all about the same. I'm not saying the actual games are the same, but all the silly things to keep fans interested, I guess, are all about the same. It's crazy, and it's very tiring. We had a good time, but I was really wiped out by about the 3rd quarter. There's something about the lights and the constant noise that is really wearing.